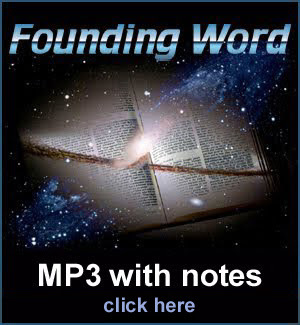 I decided to go ahead and create www.FoundingWord.com for the exclusive publication of my recorded MP3 files with verse-by-verse Bible commentary and study notes. I hope these podcasts will work together to build a no-holds-barred broadcast. The Bible proves to be an authentic message from one who transcends space/time and it breaks through the fog of all that is called religion. At times, I'll include the latest scientific discoveries and even touch upon some of the weirder and more controversial portions of Scripture that most of today's Christians avoid. For more information about the research material and how these studies are formed, check out the "About Me & Founding Word" page I put together for the new site. Feel free to check everything out and download all you want. For starters, I think we'll go through a synchronized study of Matthew, Mark, Luke & John. I think this is gonna be a lot of fun.